Dubai is blazing a new path for cities in the United Arab Emirates (UAE) by calling attention to energy consumption in buildings and highlighting the lack of data available to benchmark usage rates and measure progress. 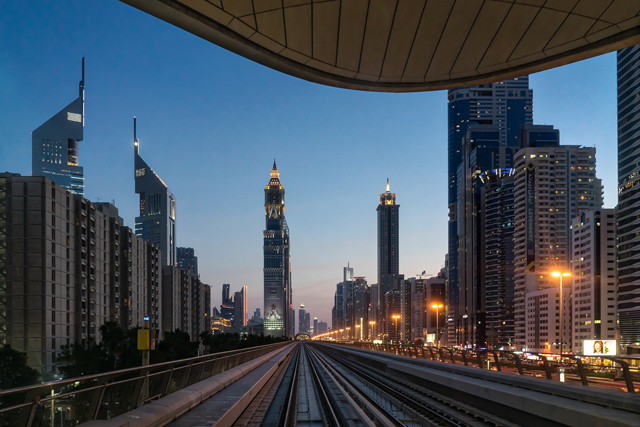 In 2016, Dubai joined the Building Efficiency Accelerator (BEA), a global network of cities led by WRI Ross Center for Sustainable Cities, and proposed a new policy on energy performance labels for existing buildings. The city government launched a pilot project in February 2017, led by the Emirates Green Building Council and Dubai Supreme Council of Energy, to measure the performance of 100 buildings. The Word Green Building Council is a delivery partner for the BEA, supporting its Green Building Councils involved in the program. Why is building efficiency important for Dubai? Majd Fayyad: Buildings account for 70-80 percent of energy consumption in the UAE, where we face high temperatures much of the year. There is therefore a great deal of potential around reducing energy demand and shrinking the carbon footprint of buildings. The government of Dubai has identified 30,000 inefficient city buildings in need of retrofits. Initially, in alignment with the government’s energy saving targets, the BEA project aims to benchmark the energy performance of 100 buildings in three focus groups: hotels, schools and shopping malls. In line with Dubai Plan 2021, the government aims to make Dubai one of the most sustainable cities in the world with a primary focus on green buildings, renewable energy and sustainability. Who are the stakeholders involved in the project, and how do they work together? Fayyad: We created a team that consists of key city developers who are leading the charge on energy efficiency and will provide case studies for the benchmarking project. The advisory committee includes consultants and industry leaders, such as companies and utility providers, who can provide expertise by reviewing the benchmarking methodology and reports. Lora Shrake: At the launch of the project, we held a stakeholder engagement workshop to ensure that attendees were updated on project progress and technical scope. Participants identified the energy labeling policy and energy benchmarking projects as the important issues to address while working with the BEA. Stakeholders also discussed facilitating comparisons of individual buildings and measuring progress toward targets for the entire city. How do the different areas of stakeholder expertise strengthen the project? Fayyad: The Emirates Green Building Council is offering technical benchmarking expertise based on an existing hotels benchmarking project, and the Dubai Supreme Council of Energy is offering expertise through an energy intensity mapping tool. Through the advisory committee and stakeholder engagement, we are asking industry consultants to evaluate the technical methodology for benchmarking, while the Council focuses on regulation and policy implementation for existing buildings. Developers benchmark their own properties against others, helping drive the market toward retrofits. Why did Dubai choose to work on a benchmarking project? Fayyad: There are currently no benchmarks for existing buildings in Dubai, no measure of performance that could easily be used to compare buildings or align building energy performance with goals for the whole city. The 100 buildings analyzed during the pilot project will contribute to a baseline that will allow us to create better targets and policies. The project supports the city government in developing strategies and targets around energy efficiency for existing buildings in line with the Dubai Clean Energy Strategy and the ongoing efforts at demand-side management and energy diversification. The project will also help developers benchmark their properties and evaluate performance, allowing them to go further with audits and retrofits, contributing to the city’s sustainable development. Maha Khogali: The stakeholder engagement workshop provided valuable feedback from industry leaders and was necessary to begin the process. It showed that there is demand for benchmarks. This could be a milestone toward an energy labeling policy, which reflects the vision of the UAE at large. What are some challenges associated with the project? Khogali: We are currently in the beginning stages, but we anticipate overcoming two general challenges: funding the development of a sophisticated online portal that will help with benchmarking, and collecting enough information about all 100 buildings to produce accurate comparisons and baselines. However, we are already addressing these potential challenges by working with our strategic partners and members. The Emirates Green Building Council has a substantial number of partners who are working toward a shared vision for a sustainable city. We have invited them to support the initiative through data contribution or sponsorship of the online tool. And, as Lora mentioned earlier, we are making a concerted effort to attract global stakeholders involved in the BEA to help. How has this project helped you understand the different views and roles of stakeholders involved in building efficiency in Dubai? Khogali: This project has emphasized the key roles of the different stakeholders and strategic partners. The partnership gains significant value from the contribution of different players. We also recognize the government’s high ambition in achieving energy efficiency. Fayyad: The BEA project was created to help facilitate public-private partnerships. The Emirates Green Building Council, as an organization that represents industry, reaches out to our members and provides technical expertise. The Dubai Supreme Council of Energy represents the city and is driving local energy targets. Through engagement with BEA, WRI, and the benchmarking project, the Council will be better informed to develop policy that the market is ready for and will achieve Dubai’s energy efficiency targets. Elspeth Holland is a Junior Project Manager with the World Green Building Council. Shannon Hilsey is Project Coordinator for the Building Efficiency Initiative within WRI Ross Center for Sustainable Cities.